kadsur: Running & Cycling with cast!!! Running & Cycling with cast!!! A week before when a fell from the bike that lead to casting due to fracture on my left hand near the elbow. Post casting as i was talking to the doctor, it struck to my mind, it would be a challenge now to keep up the fitness . I didn't want to lose the fitness because i worked hard building it. I was curious to take the discussion with doctor on fitness and interested in knowing what he thinks and how do i get benefited from it. He told me very few people ask this question, working out during fracture. He went on, it is actually other way round, we insist on patience to keep physically active. 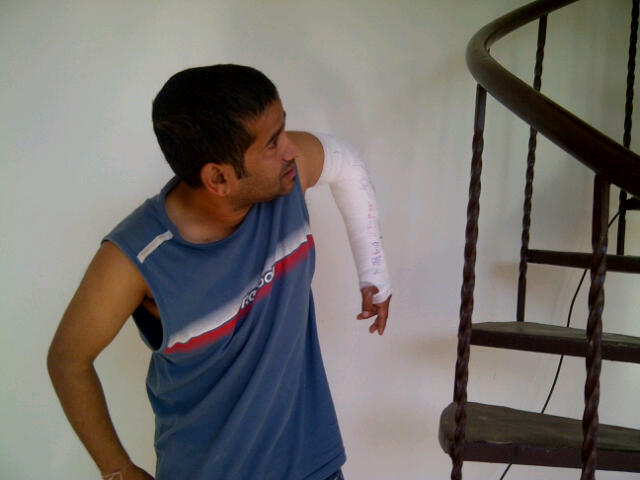 Many a times it so happens, fractures comes as a surprise and they take good amount of time to face it. He told you can run, make sure you keep the pace low. Next day after returning from work, started my running, initial few meters i felt bit heavy, imbalance and was getting adjusted. After that it was such a joy doing it i started enjoying every bit of it. To the surprise of onlookers, simply because, someone running in the night, barefoot and the cast on his hand. I was more concerned where do i keep my legs, as i didn't want to fall again. It was such a nice feeling at the end of it, i felt so light, i was feeling bit heavy with the casting in my hand. Next couple of hours i could feel bit of dis-comfort as sweating was not drying easily. When you are used to getting fresh after the run, this was really a challenging situation to go through. 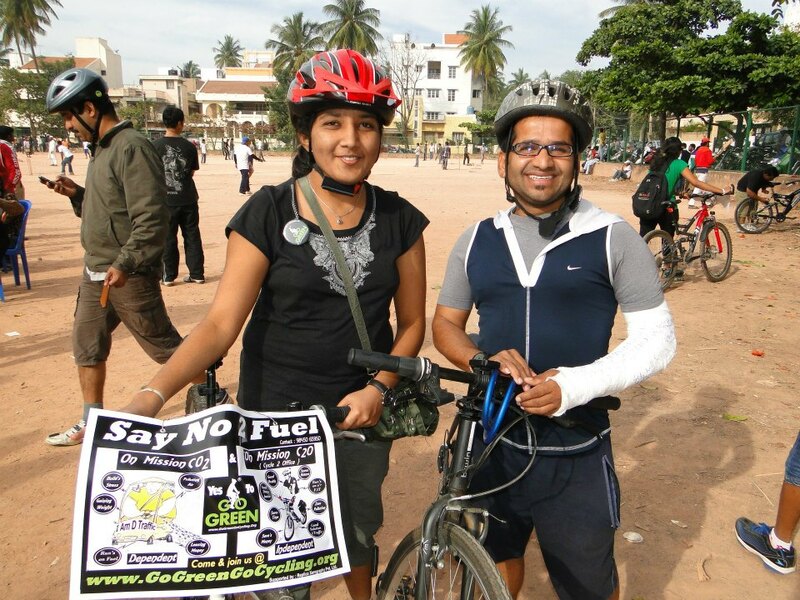 As days passed this continued, 16th Dec was a Go Green ride i was thinking of making it for the ride, where i can meet lot of cyclist whom i know. At the same time i just wanted to get out of this fear from my mind, feeling of falling and bike ride is not safe and what not. I know faster i overcome that it is all the more better. Spoke to my brother Vinay b rao who had a hybrid and can i borrow it for a day, he didn't had any issues as he was having his exams going on and no plans of going for any rides happily agreed for it. Lower the saddle post to the best possible height. Got up at 5.21 am and got ready and left the house at 5.55 am where everyone was sleeping as it was Sunday. Starting off is a bit of concern as balancing initially is an issue, took the support of foot path and took off. From the house for a km it is uphill, not very steep manageable even with single hand. As is was riding it is not the uphill that is challenging, it is the road humps, unexpected people coming in the way and downhill. 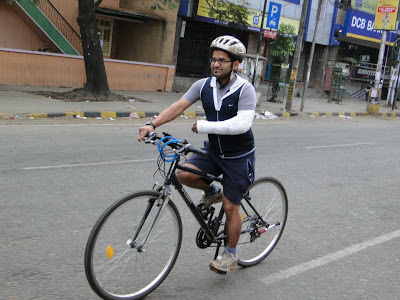 I was riding the bike with single hand, managing with front brake, even at the lowest level of the saddle i was not able to reach the ground properly. 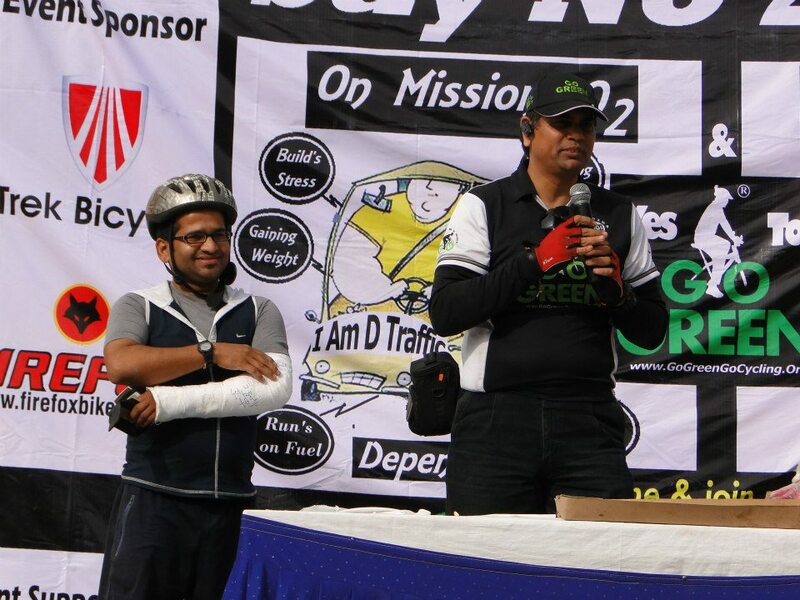 I was riding carefully even then i was riding at 16 kmph, when i reached 4th block there were hardly few of them at the ground, they were familiar faces. As this ground was facing BOTS met Karan, he was just entering the shop for finishing some pending assignment. Wished and spoke to all them after locking the bike to a telephone pole, there was nothing much of help i can extend to them with my status. Left from there for a cup of Hot coffee at Mayya's. It was awesome taste and nice morning weather made a good combination. Now when i return back to the venue it was the most happening place looked so lively felt very warmth in the cold chilly weather of Bengaluru. It is one after other explaining them, how did it happen and ending it with a surprise in there eyes, when i say i came by bicycle. It didn't made sense to me for a cycle ride coming in any other mode. 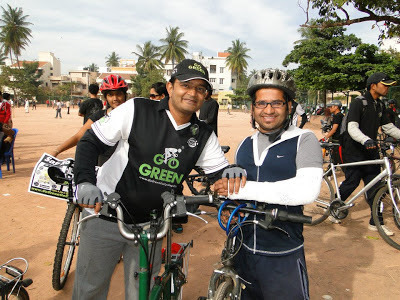 After a while the local MLA came, with a short speech and he completed the inauguration, ride took off. This is how i rode!!! Compared to my early morning ride this was lot more easier as we had lot of cyclist around i need not worry about the other vehicles i felt quite safe, to most of the distance Mohammed rafi rode with me supporting me (thank you Rafi for the care.) and chatting about his future and current running plans and switching over to barefoot running. Here the new challenge was riding with so many cyclists, what if someone cuts short, come very close where i find it difficult to maneuver. Over all a good ride and it ended up at 9 am back at the ground. Rao called me on stage and say a few words(Rao thank you for the warm introduction, appreciate the effort put in making difference to the city), i spoke few words trying keep myself as humble as possible. I never wanted to sound anything different, it is long way to go before i make a statement, it is just a journey. Here i met my cycling buddies, San jay, Brijesh Nair, Ashish Nehra, Parag, Rajesh Naik, Sohan sintre, Sanath kumar, Janardhan, Darshan, Abhinadan, Naresh Khandai (photo courtesy) Shubhashree and many more, will not be able to take everyone's name. Before heading home, a last cup of coffee with Rajesh Naik and Sohan awesome time discussing everything under the Sun. After the breakfast reached home safely without any hurdle. That completes 22 kms ride in the morning with casting!!!! Awesome buddy.. Passionate fitness freak. People will see you crazy when running barefoot and having a cast.. Thank you Rafi....true, agree to that. you too equally inspiring when it comes to fitness am not doing so many things what you are doing. Your spirit is so contagiously inspiring! Wish you all the best for all the upcoming milestones. And thank you so much for that motivation. Thank you Shubhashree, i acknowledge and accept your kind words.